Release Date: February 17th, 2006 (Film Forum) by Zeitgeist Films. The Cast: Julia Jentsch, Fabian Hinrichs, Alexander Held, Johanna Gastdorf, André Hennicke, Florian Stetter, Johannes Suhm. BASIC PREMISE: After Sophie (Jentsch) and her brother Hans (Hinrichs) hand out anti-Nazi fliers at a university, the Gestapo interrogate them and accuse them of high treason. 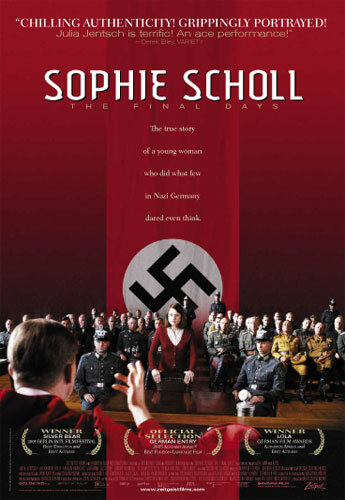 ENTERTAINMENT VALUE: Sophie Scholl excels on all levels, especially when it comes to Julia Jentsch’s amazing performance. Sophie and her brother Hans are both members of the White Rose, a German opposition group during World War II. She never uses violence, but her thoughts and words are just as threatening to the government. Everything remains calm and peaceful until she and Hans get caught spreading around fliers throughout a university in Munich. From that point on, Sophie Scholl becomes an edge-of-your-seat, suspenseful drama as Robert Mohr (Held), a Gustapo interrogator, thoroughly questions Sophie and Hans separately. The dialogue between Sophie and the interrogator sparkles with plenty of conflict and tension as they both speak their mind. Just watching the two talk to eachother allows you to keep your eyes glued on the screen. As the interrogator digs deeper to find Christoph (Stetter), a friend who assisted Sophie and Hans, the plot becomes more complex. Even the interrogator is not as one-dimensional as you might expect, although he does remain cold and fascist. Fortunarely, Director Marc Rothemund keeps the focus on the characters and makes them believable—not one moment feels contrived. Every true-to-life scenes helps you to actually end up caring for Sophie, Hans, and Christoph as human beings. The superb set design along with the costume design also gives the movie a true-to-life feeling. SPIRITUAL VALUE: The third act is very difficult to sit through because of the heartbreaking court-room scenes and the inevitable consequences. Sophie never meant to hurt anyone in her entire life—she just wants people to open their minds to reality. Unfortunately, during those fascist times, anyone opposing the Nazis for any reason in any way was guilty of high treason. The problem is simply that fascists did not allow for reason, logic or, especially, individual thoughts and freedoms. When you listen to the interrogator argue with Sophie, it’s very easy to feel angry at the way he dehumanizes everyone, even himself. Sophie’s beliefs about equality and freedom represent the voice of many people who are simply afraid. It’s very inspiring to watch her courageously stand up against the Gustapo and fearlessly speak her mind from the bottom of her heart. IN A NUTSHELL: Powerful and emotionally-gripping from start to finish! Julia Jentsch gives a phenomenal performance!